Soft Water Delivered, Without Salt! Want softened water but don’t want to buy, install or maintain a water softener? Do you live in a brine restricted municipality where there is an automatic water softener ban or restriction? 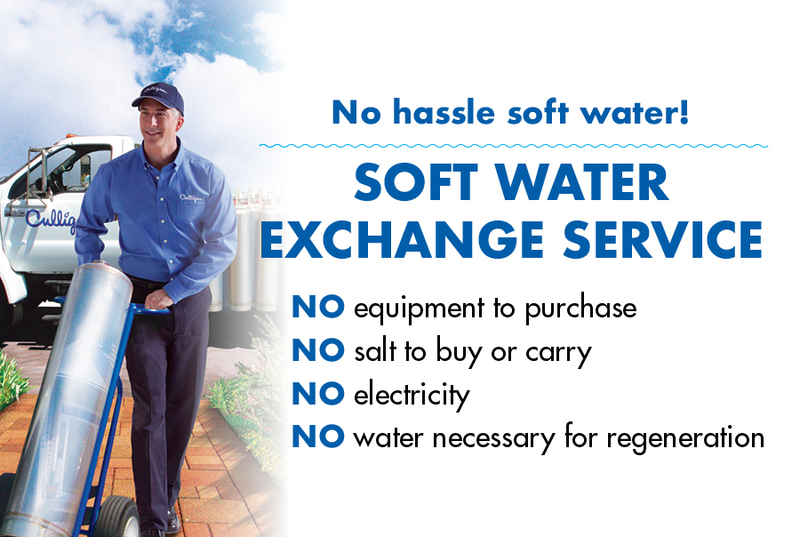 Culligan’s Portable Exchange Service delivers Culligan soft water to you. Ideal for brine restricted areas, and seasonal homes, lake houses, apartments, condos, town homes, rental properties, or homes with limited utility space, the Culligan Exchange Service really delivers. Culligan’s Portable Exchange Water Softening service regenerates the soft water tanks at a regeneration plant. Your Culligan man simply delivers the tanks to your home, and you have soft water with no brine discharge, no salt delivery, no hassles. Enjoy clean, filtered, soft water at every tap in the house. Requires no electricity, no changes to plumbing. Portable Exchange Filters can be customized to address your unique water problems.